The red train is smooth but around it where the wheels are nicely textured. The blue car is also smooth but the wheel textured in sorta smoother than the train. The green elephant is the smoothest one in fact it is the best one to help when teething is first starting. 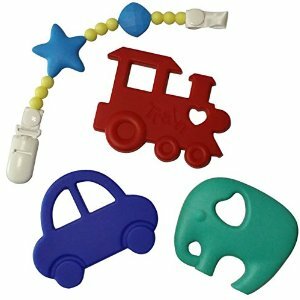 The roughest one I think not speaking of what my little one says lol is the pacifier clip, with all the small balls then the star and then a blue shaped ball. I have put a few of the toys on the clip and she enjoys that. I am very pleased to have tested these out for free.